Chatbot will help to collect the GDPR consent, with no fuss. HomeBlogChatbot will help to collect the GDPR consent, with no fuss. During the Mobile World Congress 2018 in Barcelona, ​​we presented Chatbots for companies, that uses AI to collect consents to satisfy the General Data Protection Regulation (GDPR). Labor-intensive collection of customers’ consents for processing of their personal data will soon be the responsibility of online portals and stores after the entry of new provisions to the GDPR. This will apply to both telephone and chat conversations. For some companies running live chat for their clients will be a problem – both organizationally and in terms of usability. Our Intelligent Assistant in chat mode will be able to fluidly converse, without the involvement of a consultant, and collect all required consents, thereby automating the whole GDPR process. The Intelligent Assistant solution will help companies to comply with the new regulations, and customers will avoid having to fill in cumbersome forms. Lack of consent does not automatically have to end the chat. 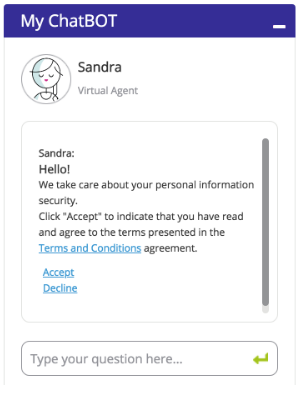 Unlike traditional methods of obtaining consent for data processing by displaying a form, Chatbot will hold a conversation with the client—a text conversation—during which it will ask the customer for consent and provide appropriate information. Then, the chatbot’s intuitve conversation engine will start one of the two work modes. The first mode is activated when the client agrees to the data processing. Chatbot gathers the consents in a few simple questions and saves them to the system. The whole process will be extremely intuitive for the client – modeled on a real-world conversation to which customers are accustomed. The second mode accounts for more pessimistic scenario in which the user does not agree to the processing and Chatbot will automatically switch to a data anonymization mode. In this situation, the chat will continue until the client’s problem is resolved, but any sensitive data will be hidden, replaced with some placeholders (usually asterisks). In this way, the data are not processed, and thus, are not saved onto the servers, meeting the conditions of the GDRP. 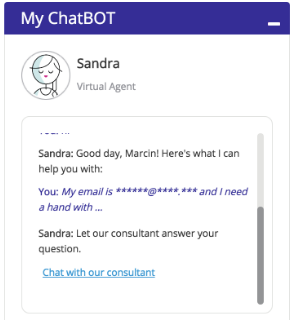 A 100% automated conversation with our intelligent Chatbot can of course be used to gather consents when forwarding customers for Live Chats, thereby saving valuable consultant resources. Significantly streamlining Live Chat and Contact Center consultants’ tasks, and increasing the effectiveness of collecting consents (higher conversion) are the main benefits of using Chatbot technology. The use of artificial intelligence (AI) as a digital automation technology should reduce the burden on companies that must adapt to changing regulations, in this case the GDRP. The mobile and web version of the AI-Chatbot which will solve the problem of acquiring customer consents, will be ready for use in online banking, insurance portals, online stores, as well as for websites where they will enable online reservations or purchases. It is expected that their widest application will concern e-marketing activity, customer service processes and online transactions (e-commerce).